You don’t have to just take our word for it… Check out these reviews from our SHOCKTOBER ATTENDEES! ARTICLE: MY BLOODY VALENTINE OFFERS FEAR, ROMANCE IN LEESBURG, BY TIFFANY ARNOLD, WTOP.COM. 12 FEBRUARY 2016. ARTICLE: DARE TO SCARE FOR A UNIQUE VALENTINE’S DAY, BY ADRIENNE WEST, NORTHERN VIRGINIA MAGAZINE. 9 FEBRUARY 2016. PRESS RELEASE: SHOCKTOBER OPENS ITS DOORS FOR THREE NIGHTS IN FEBRUARY AND ONE NIGHT IN MARCH! 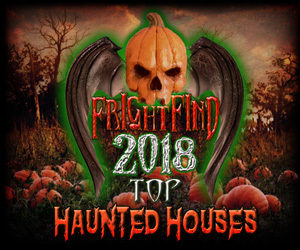 Shocktober is an award winning haunt!